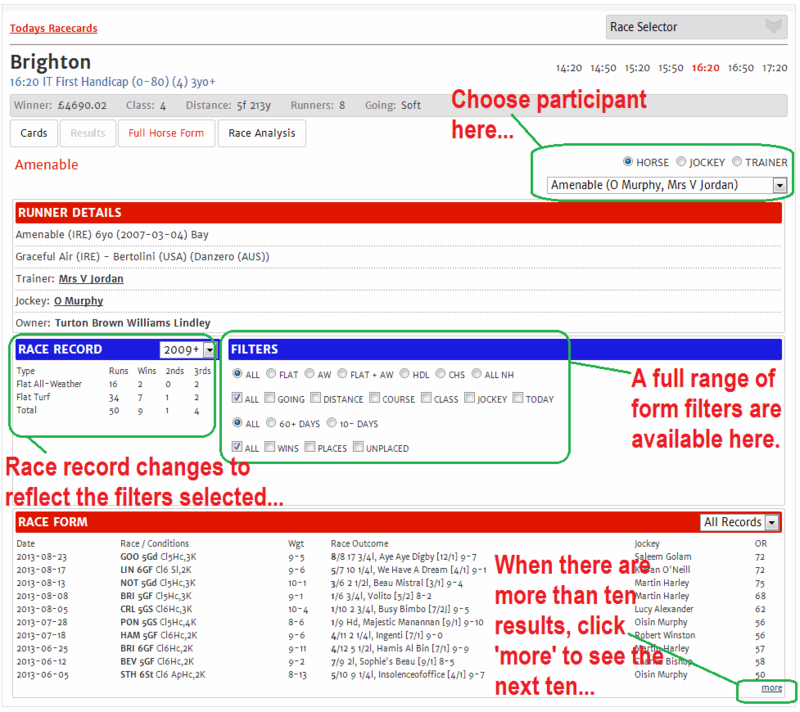 As of the end of February 2014, there are now numerous new - and very cool - features within the geegeez racecards. Below is a video which explains how the main features work. It's well worth a watch. The key features are under the various tabs. On the 'Cards' tab, you can view the horse's last six runs by clicking the little horse icon by its name. 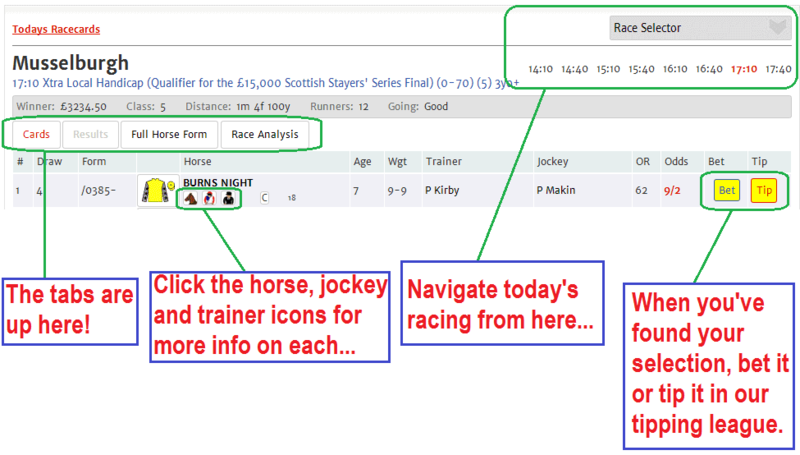 The jockey and trainer performance since 2009 can also be seen by clicking their little icons. To move around the day's racing, use the Race Selector dropdown or, to move to another race on the same card, just click the race time. When you've found your idea of the winner, click the odds or the Bet button to be sent directly to the best odds bookie site; and/or click the Tip button to tip that horse in our prize tipping league, where you can win hundreds in prizes each month. The cards also now include icons linking to Spotlight horse comments; breeding analysis; and a full head-to-head breakdown of each horse's performance against today's rivals. If you'd like a more in depth review of the form, no problem (I do too!). Just click the Full Form tab. From here, you can drill down into the form of the horses, trainers and jockeys in the race. Using the exclusive form filters, you'll be able to see only runs for this course, distance, class, going, jockey... or any combination thereof. You can also filter solely on wins, or wins and places; and you can review any specific year back to 2009. This is a very, very powerful profiling tool, and it's well worth taking ten minutes to get to know. And that's where we're at just now. As you can see, they're pretty fricking cool! Currently in development is a Best Odds Comparison tab, and a Pace Analysis tab. I hope these will be ready before the end of September, but time will tell. Now, there are one or two known issues currently. Please be aware of these as you're working round the cards. Firstly, sometimes the page will take a moment to load. This is something we're monitoring and is to do with how it accesses the database (blah, blah, etc etc). Anyway, if this does happen, please wait for a moment (say, five seconds or so). If still no response, refresh the page. Occasionally, when navigating the full form, you'll see the word 'null' appear for trainer, jockey and owner. If this happens, also hit your refresh button. Finally, sometimes the page actually fails to load even after refresh. This is not very often but it does happen and, when it does, you'll need to close the window and start again. Clearly, these are annoyances, and we are working on them. But I hope that the flexibility and time-saving value of the tools will more than justify your tolerance when things go a bit skew whiff. IMPORTANT - I'm aware of a current issue with Internet Explorer. Please use another browser (Firefox or Chrome for PC users) to access the cards. Why not add it to your favourites? Would it be possible to add a column showing the best RPR of each horse at the distance of the the race? Matt, this is great stuff! And very easy to use. Well done, and many thanks! I’ve had a quick look at your new race cards and I must say they look great for narrowing down the field.It is good that you can compare all the runners at the same time.Thanks Matt I shall definitely be using them on a regular basis. Top of its class…Looks good, easy to use, powerful form tool to assess trainer, jockey and horse form…can’t really ask for more…a huge thank you! Maybe for the future a course type/constitution tab could be added to Race Analysis Tabs, to assess how horses perform on differing types of tracks (undulating, flat, minor undulations, LH, RH or Str). Just a thought…and once again the RARs are simply fantastic! Superb Matt, I am very excited about the Pace Analysis tool. What I really like about these is the ease at which you can get a feel for how competitive a race is – and it becomes clear quite quickly what races to avoid or treat with caution! Ps – if coping with new mark, Dr Irv looks a good bet in the 3.10 Muss!. Excellent source of information. Need to play around with to get the full benefits. 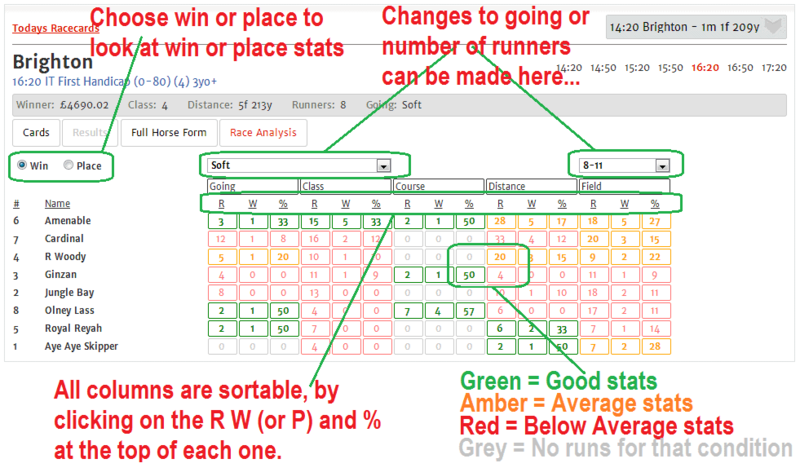 Only constructive criticism, is that I would like the red to be brighter than the orange in the Race Analysis page, as on some computers it is not easy to pick out on first glances. Maybe just me? Not just you, Graham. We’ve actually spent a bit of time trying out different hues and fonts! We decided that because amber is more important than red (i.e. amber highlights a horse with some form, red generally shows a horse with none), that we’d emphasise orange over red. I’ve found the cards really useful so far, particularly in either confirming my thoughts about a runner or giving me pause for thought – the race analysis function is excellent for this. I’d love to see more features around handicap marks. Ideally, it would be so helpful to see the last winning handcap mark and highest winning handicap mark for each horse, or to make life even easier an indication of how much higher or lower they currently are from those marks, if that makes sense. Anyway, thank you for a great tool that offers something genuinely different from the norm. Fantastic news – I was hoping you’d say that! Superb, Matt. I’ll be using this today at Musselburgh. Your hard work on this does you credit and I applaud your efforts. Hi Matt in the filter section a handicap and a non handicap button would be nice, otherwise very good and the things you are going to add will make them pretty unique race cards. Great stuff. Thnks very much. Terrific stuff Matt, very innovative and exciting race cards! Will there be the opportunity in the future to see the racecards for the following day at all? Many thanks Matt, this site just gets better and better, just when you think its at its peak you pull out another diamond. great stuff. It’s great that people can get stuck into it straight away. And what’s REALLY cool is that almost all the extras requested are in development! Specifically, we’ll have last winning rating comparison on the Race Analysis tab; we’ll have a pace analysis tab; and we’ll have tomorrow’s cards available in late afternoon. Can’t wait to share those with people very soon! hi matt brilliant tool off work today so used it to have a go on placepot at muss and got a £1 line up . your fingertips, well done , really looking forward to using it. hi matt looked at your new Racecards BRILLIANT. Unbelievable! Just brilliant. Really admire all the thought and attention you have put into this Matt. It really shows. And to make it open access. Wow. Excellent and easy to read race info. Very useful tool. I too cannot wait for the pace rating addition. First class job, Well done. Matt. Dave. Great day yesterday, Friday. Is this the Holy Grail? Excellent analysis. As Monty Python might have said, it’s not the holy grail, it’s a very naughty report! can you explain the reason?. Yes, currently the rating is updated AFTER the race, so the winner should always have the same T and L after racing. We are in fact amending the code here so that in future the rating is NOT updated after the race. poor old Bookies who cares. Can’t wait for the rest of the features to be added. I’ll be cancelling my subscription to a particular form research tool and paying my few quid to this all new singing and dancing form tool; I’ve had some decent wins upto now using the rars. Congratulations matt on a superb form tool which can only improve the more that you add to it. Thanks Yorky. We’ve a fair bit in the pipeline, and hopefully all of the features will be easy to use, and profitable to follow! excellent stuff being using since day one and another 8pts up today really confident in finding a couple of good priced winners every day/other day and i still am a novice racing fan!! It’s T – Today’s handicap rating, L – Last winning handicap rating, D – Difference between today and that last winning rating. Thanks for all this. Brilliant !! hi, these cards are great,found some great winners already,is it possible to access old cards? Thanks, glad you like them. It will be possible to access old cards soon, via a search function. We’re working on that at the moment. Will that still happen ? I cant access a computer at work, will be handy to pick selections the night before. Finally got into your excellant new site Matt.I puta bet on Slipper yesterday but oh dear .As you know I remember ADO and company and wish you well with your new signing.What was the name of the very first Gee Gees syndicate horse ? Yes, I still haven’t spoken to the trainer about what happened there. Suffice it to say, what was expected and what happened were not very well aligned. First geegeez syndicate horse was called Obvious. There are no ‘geegeez’ ratings. These are the official ratings from the British Horseracing Association handicappers. If you mean, will it be possible to print off the race cards in the future, then that’s a ‘definitely maybe’. I see. No plans to do that I’m afraid, though you can review previous races from the full form, and the past RAR’s etc are there too. Hi Matt, the new reports look immense and I hope will prove a valuable addition to my arsenal to finding winners. Could I ask is there any plans to consider a daily report which would show horses dropping in class or grade. I have found this to be a very interesting angle and have found winners on the flat and over jumps at 16-1. I do not back everything dropping in class, you have to consider its chance but its a definite way into a race. That’s a good idea. There’s no plan currently to do that, but we’ll add it to the ‘possible’ list. At the moment, that’s all on hold. But this is something which I think would add value, so will definitely consider it. Hi Matt new reports look good, do you have plans to add a 7 day trainer form? I understand you are very busy but would it be possible to have a Q&A forum as I have a couple of questions which have been puzzling me. In September there was a 7 runner 2yo race in which 6 of the runners were reported to have been born on the 1st of Jan I thought this to highly unlikely and was chatting to someone regarding this they said that foals born in Dec would be given a birth date as Jan 1st do you know if this is the case? I have noticed that the man with the white flag raises it before all the horses are in the stalls and the commentator confirms this, I always thought this meant that they were under orders and if a horse didn’t run you lost your money, how can it be right that a horse is deemed to be under orders when it hasn’t entered the stalls. If this isn’t the reason for the flag what is it’s purpose? No plans for a forum. Tried it, and but it didn’t really work very well. All horses born in Northern Hemisphere share a birthday of January 1st. In other words, all horses age one year on Jan 1st, irrespective of foaling date. In the Southern Hemisphere, it is July 1st. The white flag means ‘prepare for a start’. Nothing more or less. There is no correlation between this and a horse being ‘under starter’s orders’. Hi Matt thank you for your reply it must just have been a coincidence that 6 runners were born on the same day and the other one in March. To clarify, all Northern hemisphere horses have an OFFICIAL birthday of January 1st. They can be born any time from late December to May, though normally February to April. Are you still having problems with trainer/track stats ? everything else loading except those ? Which part of the racecard are you experiencing difficulties with? I’m getting no response from clicking on ‘Trainer Stats’, ‘Best Of’ or ‘Horses For Courses’, although they were working fine yesterday. The ‘How to use these cards’ is working and opens a new tab. Any words of wisdom? There is an issue – being investigated urgently – on this. We hope to get it fixed tonight. Very frustrating but these teething troubles do happen (alas). See the ‘Race Analysis’ tab section on this page, Bill. Trainer Stats; Best Of and Horses for Courses all show windows with no data in chrome and firefox today. Trainer Stats is proving quite profitable at present so hope it can be fixed soon. Really sorry for this – we’re investigating urgently. Hope to get a fix in today. I’ve been paper trading for my Dutch betting and the tools are helping me find some nice priced winners, at last I’ve found something that works! Thanks Kermit – that’s great to hear. They’re certainly excellent tools to narrow the field and often identify value against the top of the market. Hi Matt. Any plans to have drop down boxes for the fields ‘class’ & ‘distance’ as you have for ‘going’ and ‘field size’? For e.g. A horse may have no runs over 2m 3f, but may have lots of runs over 2m 4f. It would be handy to be able to check this from the ‘Race Analysis’ tab rather than checking the ‘Full Form Filter’. Not at the moment, goodfella, though that is an interesting idea, and I’ve asked my man for something similar recently (in the last ten minutes!!) in relation to another idea. Tipping Competition Day Eight Newmarket – a museum in a time warp?